I'm sold on it just from his mentioning that he spent time around Hunter S. Thompson as a kid thanks to his dad working for Rolling Stone. I do think this is a more interesting angle on the history of films and the company, especially in the regional historical context of what the Bay Area was like in the 1960s-earl 2000s for the film production scene. Like some of that came out of the rare interviews Marcia Lucas did about her role in the OT, building Lucasfilm, and walking away from that and her marriage. She's pretty blunt in her dislike of Francis Ford Coppola, especially about how he openly cheated on his wife. Certain more interesting to read IMO versus the current model of superfans turned employees doling out wisdom about canon and world building details. I haven't caught up yet, but the message I got from the earlier bits is that almost everyone in the business is there because they know someone who knows someone. @cowgirlsamurai - They were in San Rafael, Marin county in the 1970s. Same time and place as the Grateful Dead, of course they were all high or tripping on acid! Same story about Tower Records, except being the music business they were all doing coke. I wouldn't be surprised if Disney had something to do with his getting axed. Because they've done things like blocking the release of Ward Kimball's authorized biography because it doesn't fit their squeaky clean family friendly brand. They're nuts about even trying to keep company and employee history on brand. Like you know that their PR probably s**t themselves over the toxicology report for Carrie Fisher. I was once chatting with Bob Wilkins, who hosted a popular late night Bay Area TV show called Creature Features in the ’70s, which has since attained cult status. Apart from achieving local fame, he was the first to broadcast Night of the Living Dead, and I remember he brought author Anne Rice onto his minimalist set to talk about her new book, Interview with a Vampire. Locally, Wilkins was the only one paying attention to the genre, the only one to broadcast old horror movies, the good, the bad, and the horrible, as well as old Japanese monster flicks—while genteelly mocking it all, in suit, tie, and nerd glasses. Lucas wore similar glasses and must have been a big fan, for, Wilkins told me, he offered Wilkins the job of Lucasfilm president circa 1974. Wilkins declined. He passed away in 2009 and I spoke to him circa 2002. Lucas trying to hire Wilkens to run Lucasfilm has to be one of the more weirdest regional history factoids I've run across lately, up there with finding a video up on YouTube from the time the Cramps and the Misfits played a show for the patients at the Napa State Mental Hospital (?!). I can't wait to check these out. I hope there's something with Ben some point after TLJ. I don't think we'll get anything on his past until there's enough backstory provided in the ST. I just hope that's after TLJ and not only after Episode IX. 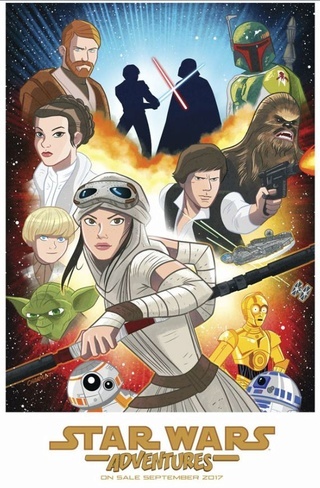 I was looking at the new SW novels coming out this fall and I found one I didn't know about yet, it's TFA told as a Shakespearian play: William Shakespeare's The Force Doth Awaken: Star Wars Part the Seventh (William Shakespeare's Star Wars) and it comes out on Oct. 3rd. Apparently there are versions for all the other SW movies, but I haven't read any of them. Experience The Force Awakens as a Shakespeare play, complete with Elizabethan verse, Shakespearian monologues, and theatrical stage directions! As the noble Resistance clashes with the vile First Order, Rey, Finn, Poe Damaron, Kylo Ren, and BB-8 are pulled into a galaxy-wide drama—in iambic pentameter! Star Wars fans and Shakespeare enthusiasts alike will enjoy the authentic meter, reimagined movie scenes and dialogue, and hidden Easter eggs throughout. Chewbacca speaks! Leader Snoke gives a soliloquy! And the romance of Han Solo and Leia Organa takes a tragic turn that Shakespeare would approve of. All with woodcut-style illustrations that place Star Wars characters into an Elizabethan galaxy. The story may take place in a galaxy far, far away, but you’ll be convinced it was written by the Bard. It'll be interesting to see Rey and Kylo's dialogue rendered in Shakespearian prose, not to mention seeing Chewie talk and Snoke's soliloquy. Yes, you're right. 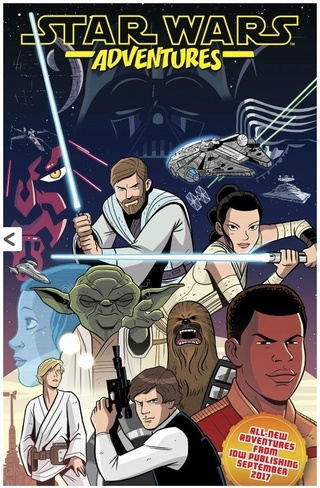 He is in one of the promotional covers and seems to be in one of the alternative cover for #1 but as Kylo and next to Darth Maul and Vader so we might get him only as Kylo Ren for the time being *sigh*. I like the second cover. The characters are drawn to my taste especially Rey. Really cool book and offers some interesting insight into the Empire's inner workings as well as some hints about Sidious' ultimate ambitions. They weren’t disrespectful, but they weren’t necessarily buying it either. They were going along with it. Back on the Original Trilogy, Mark Hamill (Luke Skywalker), Harrison Ford (Han Solo), and Carrie Fisher (Princess Leia) had understood instinctively where Lucas was coming from, though he was famously uncommunicative. It was nothing personal. As many know, “Faster” and/or “More intense,” was what Lucas often requested of his actors. In 1978, three crewmembers got into a post-film analysis of their ex-boss, concluding that he took too much on himself and stressed himself out unnecessarily. They also thought he often put his trust in the wrong people. I’ve read similar complaints about similar visionaries. Evidently, when you’re hounded by success, it often becomes difficult to tell who has your best interests at heart, particularly given that many folks may have already told you things that didn’t turn out to be true, or said that something wouldn't work that did turn out to work, and vice versa, etc., etc. It’s a difficult position to be in. Despite his directorial shorthand and his on-set suffering, Lucas, Ford, Fisher, and Hamill worked well together on the Original Trilogy and remained friends afterward. Lucas seemed particularly close with Fisher. He and Portman were never ready to be interviewed (instead I relied on EPKs). Christensen, on the other hand, had less history and was more relaxed. I was given the go-ahead to shadow him for a day, morning till evening. He was ready to talk: young, smart, with his own production company. Like many actors, he was smaller in person, more vulnerable. When we walked from his dressing room to the immense soundstage, where Lucas and dozens of veteran technicians and craftspeople were waiting to shoot the next scene, with thousands of dollars disappearing every minute, I asked Hayden if he wasn’t apprehensive or scared. Because it was winter down under, it was dark by the time we drove from the studio to his rented apartment (or house, I can’t remember). Christensen was up front, next to the driver, and I was in the backseat when he turned around and started telling me how hard it was playing Anakin Skywalker the way George wanted him to. He said that he didn’t understand why his director was holding him back, why he was asking Hayden to restrain his feelings in scenes that seemed to require a rawer emotional performance. Hayden spoke for around 20 minutes about his uncomfortable situation. I listened, knowing I wouldn’t be able to write about it then, but trying to explain that Lucas was perhaps not explaining why he was doing things in a certain way because he simply didn’t have the time or the inclination to do so. It wasn’t his style. (Please note: This was not Christensen’s verdict on Lucas—only a step along the way. I had the RSS feed set up in my Feedly account, so if anybody missed some of the posts and want to read it, PM me and I'll send you a copy. Bummer. I had enjoyed the posts that I read. Disney's lawyers must have gotten to him. @ISeeAnIsland - that would be my guess, especially with the drug, Hunter S. Thompson,counter culture, and Portman and McGregor being unhappy references. Their lawyers supposedly blocked the authorized biography of Ward Kimball that Chronicle Books was going to publish because it doesn't fit into their shiny, family friendly brand. Really disappointed in the Maul comic. You know I joked about Maul getting a girlfriend, but I really expected some kind of an ambiguous connection between him and Eldra, the beauiful Twi'lek padawan. She was always going to die eventually, and it was likely Maul would kill her himself, but the relationship had so much potential to be actually complex and interesting. Before the comic run started, they said Eldra would have a huge impact on Maul's character going forward, and that Maul would be "almost tempted away from the Dark Side". WTF? What actually happened was: Maul kidnaps Eldra, Maul and Eldra snark angrily at each other, Maul and Eldra join forces for a few pages to fight attackers, then once they're out of danger they duel, and Maul kills her. That's it. You never even get the chance to grow to care about Eldra enough for the death to have any pathos and meaning. In the end, it just showcases how edgy and bad*ss Maul is. The story was just so pointless. It did nothing to add any new complexity to Maul's character, or any new depth to the overall story. So, Maul killed a Jedi padawan before Qui-Gon, wow, that's... rad. And it had so much potential: the story could have been so much longer with loads of twists and turns, they might have been forced to work together for longer, he might have been intrigued enough to try to turn Eldra to the Dark Side (which it seemed like when he was excited to sense anger in her), she might have been intrigued enough to try to turn him to the Light (well, they did promise he'd be tempted by the light: again, WTF?)... the relationship might actually have had a lot of depth to it and it might even have tied in with Maul's later insistence to have Ezra as his apprentice. Perhaps there was someone he once wanted as an apprentice, after all, but it was not to be. I almost feel like the story was changed while one issue was delayed by a month. Perhaps the story was originally meant to be longer (it did say "Book I" after all) but they decided to wrap it up more quickly? But probably not. I just don't understand why they originally teased things like Maul being "almost tempted away" from the DS which had nothing to do with this comic at all. And how did Eldra have any impact on Maul's character going forward? She didn't. She fought, she snarked, she died. That's it. @Darth Dingbat wrote: Really disappointed in the Maul comic. I stay clear now from comics. I gave it a shot with Dr Aphra but all in all I am always left frustrated by how little emotions are explored. Also I have to make a choice time-wise if I want to only have SW-related leisure or other stuff and I prefer to keep it balanced out with other stuff. Anyhow, not watching TCW and not being a fan at all of the PT, I never quite got the fascination with Maul. It's only recently by reading posts here that I understood that there was a lot of potential to make him more complex and a lot of hope that it would happen. I have to say I was quite disappointed myself, without being a Maul fan, with his end in SW Rebels. It was just too quick. Just a couple of minutes more of maybe Maul really trying to kill OB1 before breaking down would have made it more poignant. This is probably over 3 seasons my least favorite scene and development for a character. It was like "wait, that's it?" But now I am more intrigued by the twi'lek you mention. I still have my hopes that twi'leks will make it somehow into the ST. Just because I like them. I agree with you that Maul's arc in Rebels was disappointing. I actually really liked the minimalist duel with Obi-Wan and thought his end was moving, but other than that Maul was built up like he had some grand plan for all his enemies and then it just... fell flat. I also agree with you that the comics have been disappointing. A lot of the time the stories don't even grab me, and when they do, they promise more than they actually deliver. You get an intriguing premise or an intriguing new character, and then the story just skims the surface and rushes through to the end. I have yet to see anything even half as good as the Knights of the Old Republic comic, for example, which was a long and complex story full of rich characterisation and just overall great. the Twi'lek character is actually amazing. There was a lot of build-up to her character, and when she finally appeared, she had a marvellous personality, full of potential. I just loved her, and her dynamic with Maul had tons of potential for all kinds of different storylines. This was actually the only comic that grabbed me to the point that I had to buy the e-comic issues as soon as they were available; usually I just wait for the paperbacks. I wanted to read on and on, and then... boom! Total letdown. I almost hope Eldra is going to be resurrected just like Maul himself and then spend the rest of her life pursuing revenge on him, or something. What a waste of a great new character. If I had any talent for drawing comics, I swear to God I'd make my own "this is the way it should have been" version, I'm so p*ssed off. It was obvious Maul wanted to keep Eldra alive, turn her to the dark side etc. because that is the only way he knew so her abrupt death was a terrible disappointment and a complete waste of an excellent character... I wouldn't have minded your idea of her remaing alive and pursuing him for revenge (maybe having become a dark jedi)..... I also wouldn't have minded if Eldra turned out to be another apprentice of Sidious and this was actually a battle for who remains the final apprentice.....or if they wanted her to be a jedi, it would have been nice to see him him taking her lightsaber kyber and using it for his weapon in memory of her. The only parts I liked in this story arc were the antics of the bounty hunters...Cad Bane never disappoints. @snufkin wrote: @ISeeAnIsland - that would be my guess, especially with the drug, Hunter S. Thompson,counter culture, and Portman and McGregor being unhappy references. Their lawyers supposedly blocked the authorized biography of Ward Kimball that Chronicle Books was going to publish because it doesn't fit into their shiny, family friendly brand. Well, to me writing such a blog without even changing the names is like... Duh! The guy should have known better. And if he hasn't asked for the actors' permission, I would applaude to them sending their lawyers after him to be honest. I'd do the same. To me it looks like a case of having his cake and wanting to eat it too. That there is a dark side to the movie industry is nothing new. If someone expects Lucasfilm & Co to be all clean and neat, they should wake up to the reality of our world. I mean many employees on the planet could write a blog on the dark side of the company/industry that employs them. And I understand if there's something awful happening like torture and abuse of people and animals and the blog is meant to bring awareness to the issues and have them being taken care of, but based on the extract, I don't see it. It sounds more like a gossip blog to me, which fine by me, but when you publicly gossip on the company and people you have worked with in such an obvious way, you can't be surprised that they close your blog. Just finished the Thrawn novel. Now that's a damn good book. My favourite portrayal of the Empire so far and Eli Vanto is a new favourite character for me. Hope LF does more with him. An enemy will almost never be anything except an enemy. All one can do with an enemy is defeat him. But an adversary can sometimes become an ally. There is a cost, of course. In all things in life there is a cost. In dealing with an adversary, sometimes the cost is paid in power or position. Sometimes it is paid in pride or prestige. Sometimes the cost is greater. Sometimes the risk is one’s future, or even one’s life. But in all such situations, the calculation is straightforward: whether or not the potential gain is worth the potential loss. And the warrior must never forget that he and his adversary are not the only ones in that equation. Sometimes, all the universe may hang in the balance. All of those would have been good options. And, you know, even having it all end in a duel exactly like this would have been okay, had they at least stretched out the story so that Maul and Eldra would have had a longer time to interact and develop a more meaningful relationship, whatever its nature. There was such a big build-up to Eldra's appearance that it seems insane that she got so little "screentime". What was the point? I still don't understand what the heck they meant with "Eldra is going to have a huge impact on Maul's life going forward" and Maul "almost being tempted away from" the Dark Side - actual quotes from when the comic was first advertised. Is it possible that the story was originally meant to be longer and they decided to wrap things up quickly because sales numbers were disappointing? (But I thought this comic actually sold well.) It just doesn't make sense because none of that happened. I agree about the bounty hunters - that was a really enjoyable part of the story! 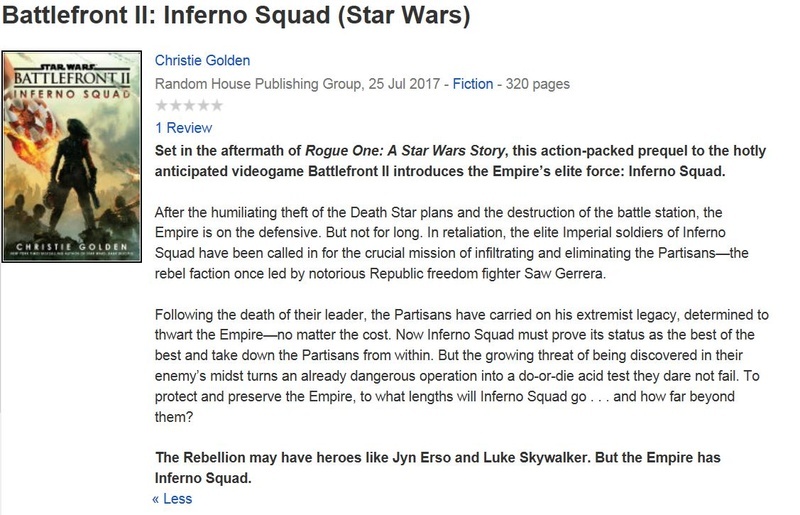 I only read the synopsis for Inferno Squad now. Am I reading that right that the story deals with the infiltration of Saw Guerrera's partisans by Inferno Squad? OMG my interest is peaking. I especially like the sentence "The Rebellion may have heroes like jyn Erso and Luke Skywalker. But the Empire has Inferno Squad." I don't read comics at all, but it really does sound like they decided to cut it short for some reason. Maybe they decided against a storyline that has some Kylo elements where the woman ends up dead? Maybe their was an issue with author? Maybe some irrational PT-hating Disney executive wanted Maul gone? Who knows? But it does sound like something was changed. Also, on writing your own comic, the guy who wrote American Splendor never did his own art. He would write the comic with stick figures and had another comic writer, the famous Crumb, do a bunch of his illustrations. So maybe you could go in with somebody. Also, if you have never seen the movie American Splendor with Paul Giamatti, I would highly recommend it. @SanghaRen - normally I'd agree with you, but this is Disney. The biography I mentioned is a particularly insane but particularly within character example of how they even want to make people's personal histories (and this was one of their central animators during the classic era who also mentored Brad Bird) if they think it's off brand. It's not a secret that Portman and McGregor were unhappy with how the PT turned out or that GL had his issues with directing. More likely it's the unvarnished truth of what day to day life was like in the company, and especially the drug references (Disney is based in a very Christian and culturally conservative part of CA versus Lucasfilm being in a more socially liberal one) which I'd guess brought him trouble. @SoloSideCousin - Harvey Pee-car! And Crumb actually used to live sort of in the vicinity of where I'm from. Before the entire family moved to France, one of the old newstand/comic book shops I used to go to would have occasional Crumb sightings when he was picking his daughter up from daycare. And he still comes back every once in awhile to play in the band he and Terry Zwiegoff have, the Free Badge Serenaders. I started Inferno Squad! Two first chapters down so only a few pages. The book seems to be shorter than the usual SW books - my Kindle app mentions 260 pages including cover, table of contents, etc. So far, I like the writing style. Easy to read. I am at the point when Iden and Gideon seem are really pissed that the Death Star is down and vow to seek revenge. Am I a bad person for smiling thinking about what their revenge will be like I mean, they're the bad guys, right? I finished Inferno Squad. Yes, I read it in 3 days. I LOVED it. I even cried. I'd put it above Thrawn in my list of preference and probably on the same level as Bloodline which is unexpected. It's as grey and muddy as you can get. Who are the good guys? Who are the bad guys? No one. All characters do terrible things but somehow you cannot fully condemn them. It's just the ugly truth of wars. It's easy to read and I found myself eager to know what happens next. I just spent the afternoon reading, only stopping for a little bit of yoga to appease my guilt of not going to the studio today, because I wanted to finish it. If you like characters like Rae Sloane, you are going to like Iden Versio and how she develops over the span of the book without fully changing neither. On top of it, she has one of the Skywalker issue: daddy issues. I don't know how the game will be. I doubt it can include the layers the book has and a great share of the book is infiltration not battle. So I don't think I will buy the game. I'd be happy to get further Inferno Squad books though. If anyone reads it at one point, I'd love to know who your favorite characters are. I liked Iden a lot, which is good because she's the protagonist . And Del and his droid. Actually some might read some hints of romance between these 2. Iden and Del, not Del and his droid Very small hint. But, I don't know. I could see Reylo play out this way i.e. a deep friendship where both seem to really understand each other. I am actually grateful that there was no romance because I was fearing a love triangle so I was happy it stayed focused on the infiltration and the emotional impact it had on the different characters. There is sort of a little bit of romance but not the one that might be expected. And I liked Dahna, but she's a twi'lek so I am biased And Piikow, but he's probably the most innocent of them all so difficult to not like him. There is even at the end of the book a "poetic" scene involving crystals. Just in case one had forgotten it's SW.